Sometimes at book-signings, my fans will bring me little tokens of appreciation. Nothing warms my heart more than someone handing me a drawing that they did just for me. Take this one, for instance, that Samuel gave me last weekend at my event at the Eric Carle Museum of Picture Book Art. …I love the scales on the feet, and the crossed eyes. It looks like something out of G is for One Gzonk! Thanks Samuel! I’m teaching a class tomorrow at the Eric Carle Museum of Picture Book Art on creating your own unique interpretation of known fantastical creatures. One of the several designs the students can choose from will be a dragon, so I’ve amassed a library of some of my favorite images to share. 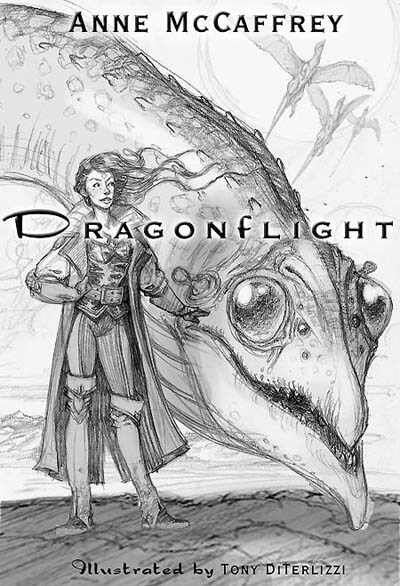 It seems the timing is serendipitous with my ongoing dragon conversation here on my blog, so I decided to include a few. 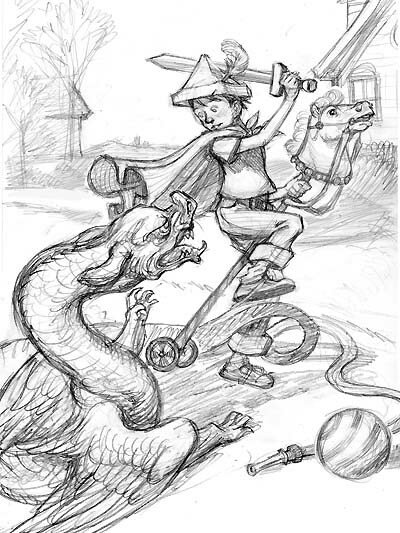 Henry J. Ford was best known for his illustrations in Andrew Lang’s Rainbow Fairy books which were a HUGE inspiration to the design of the Spiderwick books. He did this piece back in 1909. 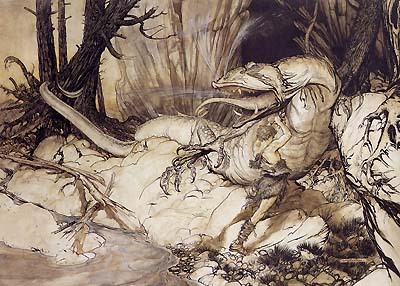 Of course, many know Arthur Rackham’s work, and I have mentioned him many times as my main influence. 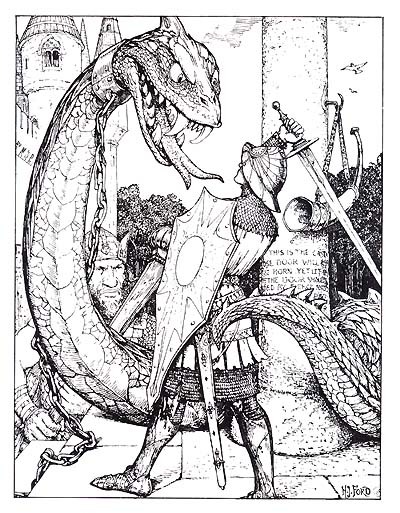 This is Siegfried killing Fafnir in his book version of Wagner’s The Ring. John Bauer is a Swedish illustrator from the turn-of-the-century. 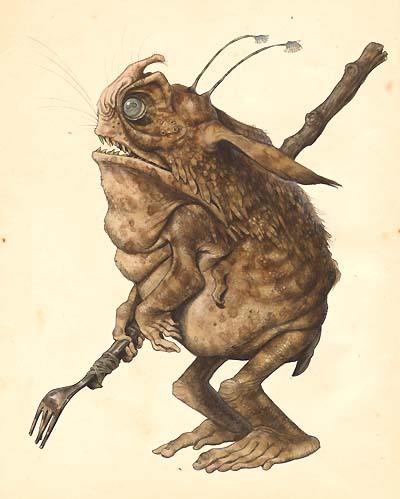 He was certainly influenced by Rackham, but had his own unique take on trolls and fairies. 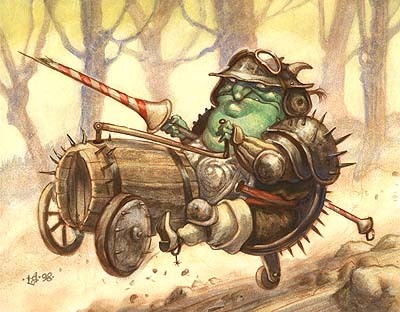 I am certain he was a big influence on Brian Froud. 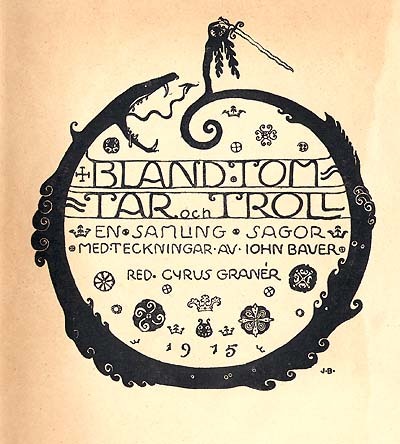 This is a title page to one of his troll books, done in 1915. Last, but not least, is one of my favorite dragon designs. This was done by Ernest H. Shepard, best known for his work in A. A. Milne’s Winnie-the-Pooh books and Kenneth Grahame’s Wind in the Willows. 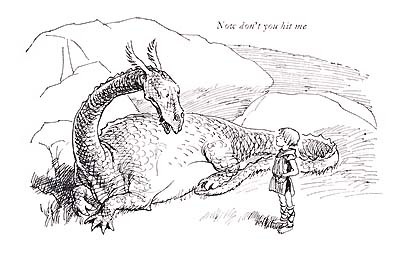 This is an image from another Kenneth Grahame short story, The Reluctant Dragon, from a book titled Dream Days. This week’s winner came from Silas. And I can’t tell you how touched I was by this one. 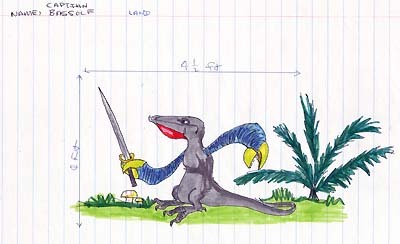 You see, Silas has copied a drawing from a book I created when I was 12 called Gondwanaland. It was about an island inhabited by bizarre creatures that I made up, along with dragons and goblins. The book was written by a scientist and structured as a field guide. So in many ways, it was the seed for Arthur Spiderwick’s Field Guide. 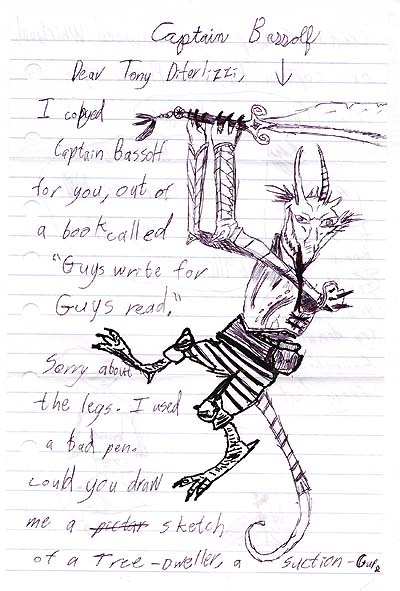 I recap all of this (along with my new take of Captain Bassolf) in the anthology Guys Write for Guys Read, edited by none other than Jon Scieszka. There are a lot of cool short stories in it from a variety of people as well as drawings from lots of my favorite artists…you should check it out. Thanks Silas! You MADE MY WEEK! Early on, Holly and I thought it would be cool if the Spiderwick books slowly immersed the heroes into an entire world of fantasy. So, by the end of book 1, they finally see their house brownie, Thimbletack. 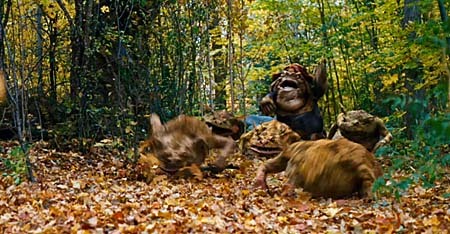 By the climactic battle at the end of book 5, they are battling an evil ogre, his goblin army, and his brood of dragons. 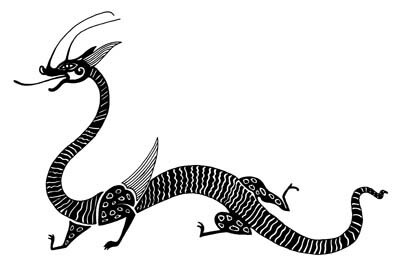 The Spiderwick dragon design was clearly inspired from Asian dragons. I had not done a long and lanky drake before, and was very excited about it. 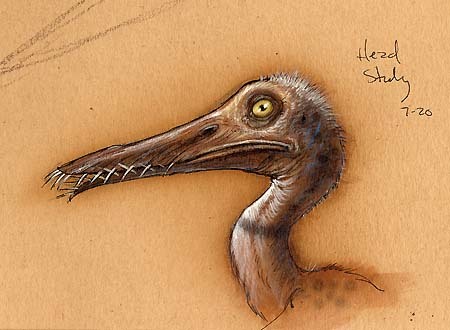 After the Pern project, I also felt less inhibited and returned to birdlike features for the head and face. The multiple legs came purely by accident. I was sketching where exactly the legs should be placed on the body not erasing any of my previous attempts. I realized it looked kinda neat having multiple legs and found that I had stumbled onto something not seen (to my knowledge) in dragon design before. Woo! A breakthrough! 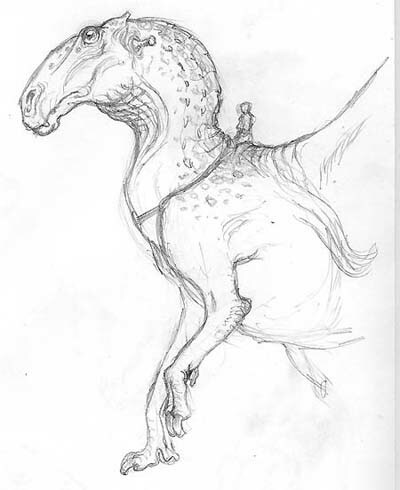 The other aspect that we pushed for was a return to a prehistoric-ish wild creature. You see, all of the creatures in the Spiderwick universe were reverse evolved from the “big fish” stories that had been told over centuries. 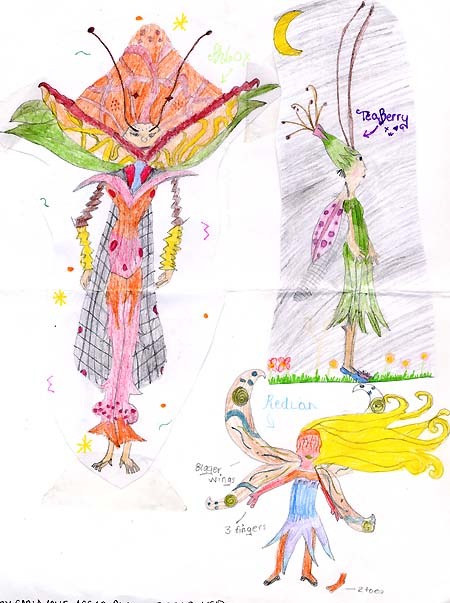 We developed the notion that as storytellers retold the tales of dragons, trolls and goblins, they embellished these beasts to tell a grander tale. So we tried to rewind these creatures back to what their original form may have been like. 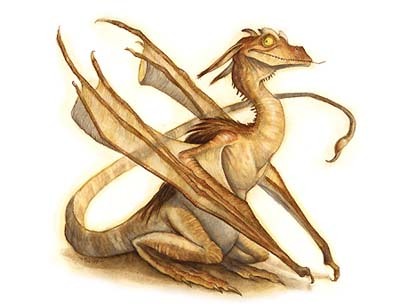 In the case of the dragon, I removed the wings (commonly seen on European drakes), made the beast smaller (about 9 feet in length), and removed fire-breathing and the ability to speak. 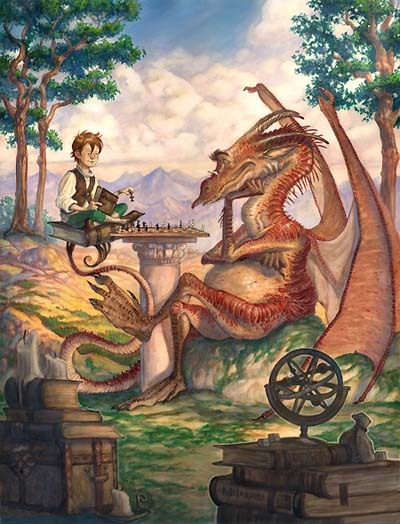 We felt that if the dragon was less intelligent and more feral, it would be harder for our clever heroes to conquer. One thing we did do, though, was embellish the toxicity of the creature. 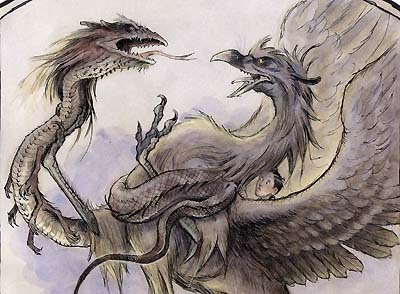 I wanted everything about the Spiderwick dragons to be poisonous – their breath, saliva, blood, claws, teeth, everything. They were Mulgarath’s weapon of mass destruction. I based this idea on a story I had read about a knight who fought a particularly dangerous dragon and vanquished it. Afterwards, the slain beast’s blood ran into the ground killing all the local farmer’s crops. The idea of environmental impact by a destructive force really resonated with me, and it also fit well into the themes used within the Spiderwick books. I started to realize it may actually be less about what a dragon looks like, and more about it actions. Really that’s what makes some of those favorite examples I listed earlier so memorable. You can’t believe how relieved I am that I’ve figured this out. You see, my next chapter book involves a classic well-loved dragon…but more about that next time. Our family doctor is a swell guy. And not just ’cause he can make you feel better. He’s funny, loves Tolkien, and is very friendly, warm and caring – something you don’t always find in the medical field. 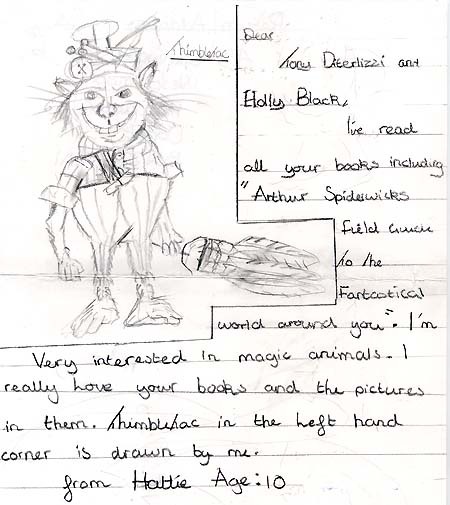 Of course, I had to give him a set of Spiderwick books (along with my covered version of Tolkien’s Unfinished Tales). His son supplied the thank you letter, along with a cd of him playing Vince Giraldi’s “Linus & Lucy” on the piano. 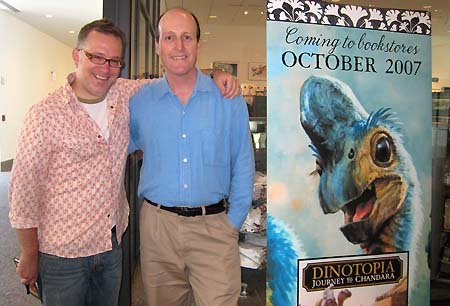 Imagine my surprise when I received a call from Delrey books in 2001 to do a “new” version of Pern – fully illustrated and aimed for younger readers. Wow! Needless to say, I was giddy to be walking in the tracks of Whelan to bring my own view of Pern to life…but alas, it never really happened to the full extent of my vision. 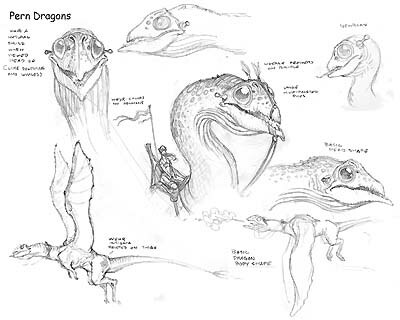 Here, for once, I did not feel the constraints I had felt when I designed the terrestrial dragons found in D&D. I was thinking less-dragon-more-space-creature, and had great fun exploring shapes and forms. I looked at a lot animals for the head design: antelope, hippo, and fledgling birds. Finally we settled on a horse-like form – not my first pick, but it certainly appeared gallant on the final cover. 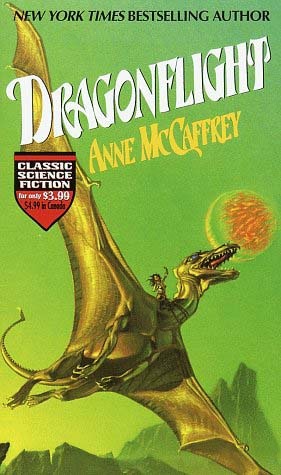 Like Dinosaur Summer, I am pretty sure my version of Dragonflight is out of print. However, the labor that went into this book was not a loss to me. Projects where I can explore ideas and flesh out concepts are always rewarding – even if it all doesn’t make it to the final product…which often happens with me. I do a lot of sketches before I even think of preparing for a final image. Despite all the fantasy stuff I’ve done in my career, I never get very excited about drawing dragons. Seriously. In fact, I kinda-sorta dread it. 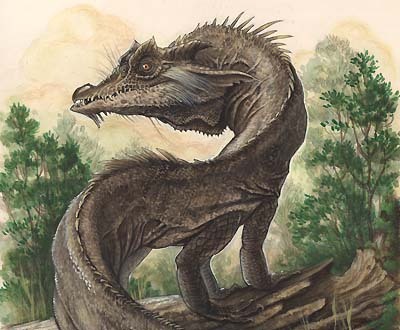 Dragons have to be the most overwrought, over-rendered, over-exposed creatures in modern fantasy today. They are found in video games, books, toys, television and movies as they are integrated into almost all the world cultures since ancient times. 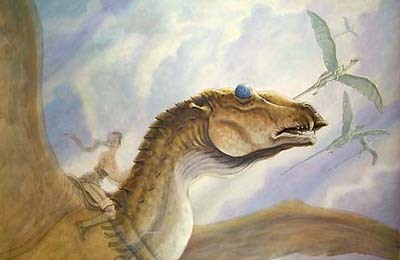 Consequently, it seems like every possible rendition of this mythical beast has been done. How can I come up with something new, exciting and fresh after centuries of masters have already done so? Honestly, I don’t like drawing them – even though I think they are awesome creatures and I love stories about them. There’s Smaug, Fafnir, Puff (the Magic dragon), Dragonslayer, Dragonheart, Dragonology, the Hydra, Falkor, Eragon and, of course, Dungeons & Dragons. Ironically, despite my years of contributing art to this iconic fantasy game, I hardly ever rendered its namesake beast. 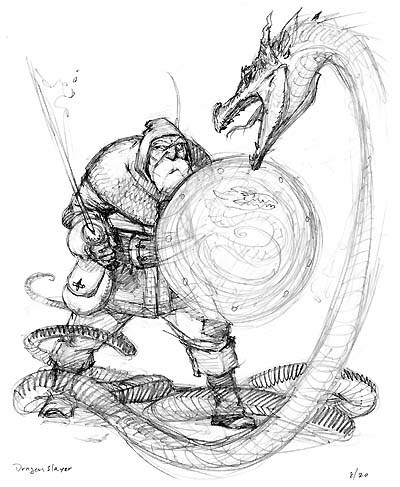 There were quite a few gaming illustrators who had the dragon-thing covered, which was fine by me. I did however, do a few dragons for the gaming magazine of the same title. Even though they are on my site, I will post them here again. In these projects, I went more for a mood and setting over a novel design. The first image, of course, is about the joy of playing games. 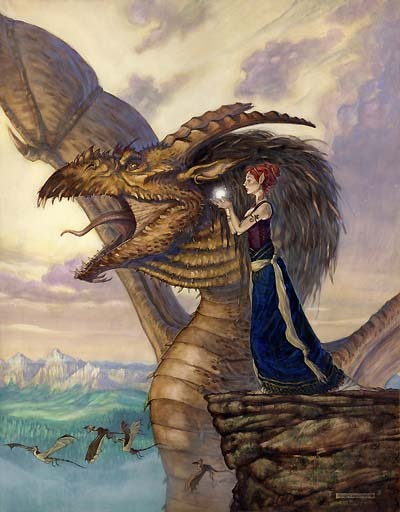 The second is more about illustrating the power of the female mage who has the ability to conjure up a massive dragon. I recently cleaned these images up for a book anthology on dragons published by the French fantasy gallery, Galerie Daniel Maghen. …which they liked, but I felt it was a little trite. And, for some reason, I liked the energy of the sketch more than what I envisioned the final painting to be. Perhaps I am wrong, and I’ll get up the gusto to finally paint it one day. Then I got clever. 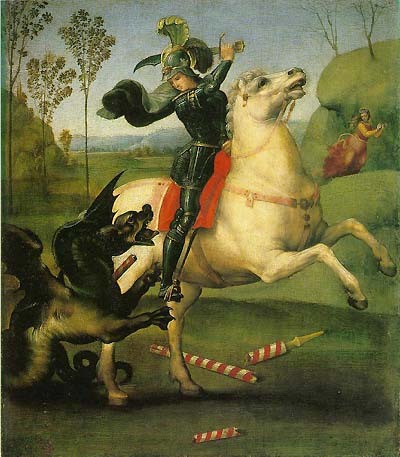 I decided to do my own take on a famous dragon image: Rapheal’s 1506 painting, “St. George & the Dragon”. Mine was titled “Georgie Boy and the Backyard Dragon”. 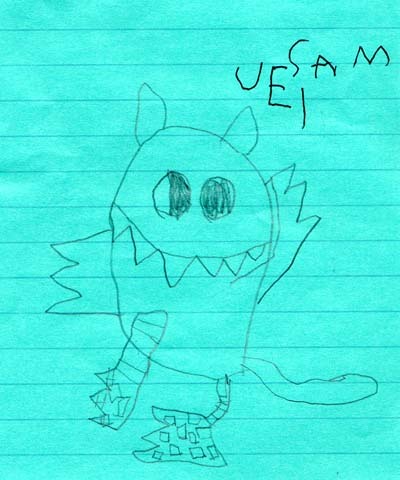 And I didn’t bother redesigning the dragon (or the horse head) and they didn’t like it. It wasn’t dragony enough I suppose. So I opted for the old dragon covers instead. See? These are tough critters to get excited about rendering. At least they are for me…though I wonder if I should paint my rendition after all…hmmm. I can see it on a greeting card with a note inside saying “Glad your feeling better – now go slay a dragon” or something cheesy and inspirational like “We all have our battles to fight and facing our fears is the biggest”. My assistant, Will, comes in twice a week to help me answer my fan mail and scan sketches, archive art, etc. He and I have a little favorite custom that we do in the studio every Friday. We take our favorite fan sketch sent in that week, and post it on my bulletin board for all to see who come and visit the studio. 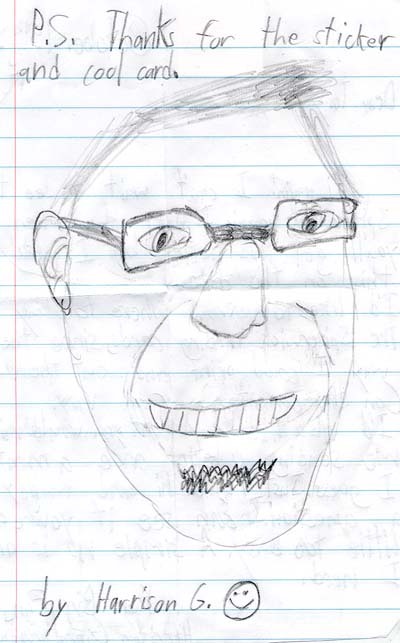 We decided it would be cool to start a virtual bulletin of the “Fan Sketch of the Week” here. 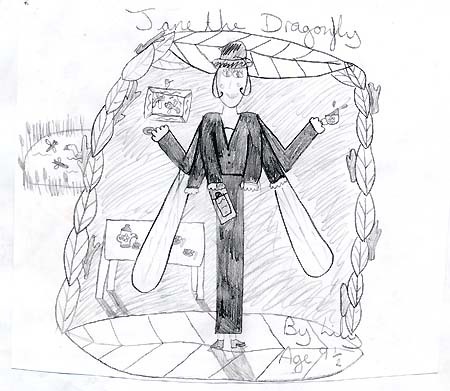 So, without further ado, here is our “Fan Sketch of the Week” courtesy of Madison from Minnesota. I was the kid who copied out of books all the time. It was how I learned to render with sense of artistic style. So, it always melts my heart when I receive a drawing, or work of art, inspired from my stuff…so keep’em coming! I’ve been thinking a bit about dinosaurs since the last post, and how much I do love drawing them. Like many boys, I was a rabid fan of all things prehistoric. Movies like One Million Years B.C., television shows like Land of the Lost, toys and models like the Aurora Prehistoric kits, and (of course) books on dinos peppered my bedroom as a kid growing up. 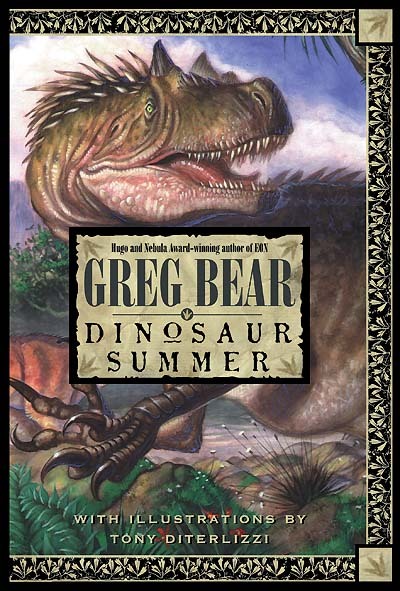 I was gonna post some of the dino art from a book I illustrated back in ’96 titled Dinosaur Summer since there is only one or two images on my site. 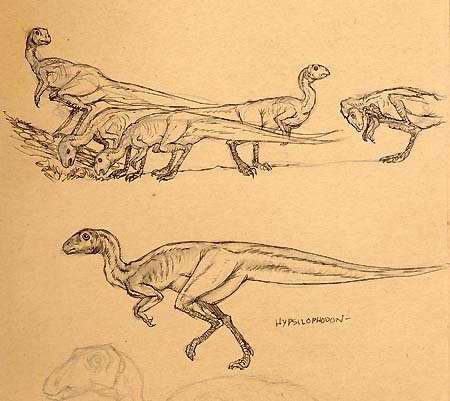 Instead, I found my preparatory sketches done at New York’s Museum of Natural History. Here, I did life drawings of the preserved fossils and envisioned muscles and skin on top. Though the book is now out of print, it was a serious stepping-stone in my career. I was contacted by the publisher based on a recommendation from Bill Stout(!) He was their original choice to render the cover for Greg Bear’s homage to Sir Arthur Conan Doyle’s Lost World. I was absolutely ecstatic to be a part of the project, though having been submerged in the world of children’s books, I could see that these adult publishers didn’t quite get how to make the book properly for younger readers…anyways, I digress. I received a flat fee for my part paid from Greg out of his advance. Not receiving any royalty of my own, one would think this was a foolish move on my part, however; I saw it as a golden opportunity to have an awesome printed sample of my work. I felt it was crucial as I continued to make the rounds to the other houses in the city trying to find just the right editor or art director to help me publish my children’s book ideas. Originally I was asked to provide a color wrap-around cover, a few color plates, and a couple of interior pen & ink flourishes. Instead, I pushed for as many color plates possible, and black & white illustrations throughout – to my joy, the publisher went for it. I remember I worked long and hard to do the best job I could within the deadline. At the time, I was quite proud of the final result (even though the publisher removed my name from the front jacket despite all this extra work). Now, of course I see technical weaknesses, but the general layouts and tone are precursors for the execution done in the Spiderwick chapter books. I am not sure how much longer I would have toiled to break into the elusive world of children’s publishing without a book like Dinosaur Summer in my portfolio. Ambitious as I was, at least it demonstrated that I had a basic understanding of book design and illustrating the story within. I suppose that is exactly what I needed at the time. I’ve a couple of dino projects on the back burners. Hopefully they’ll get shuffled forward, and I’ll have an excuse to paint lots of prehistoric pretties soon. 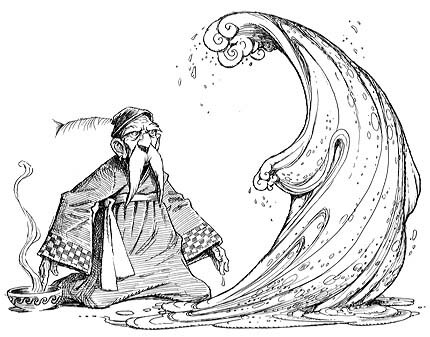 The older I get, the more I am convinced life is but a series of circular motions. But each time your orbit returns to a pivotal point in your life, your journey affects it in such a way that you now see things in a slightly different perspective. I swear. I don’t know…I am certainly no student of philosophy, but I can’t be the only one who thinks this. 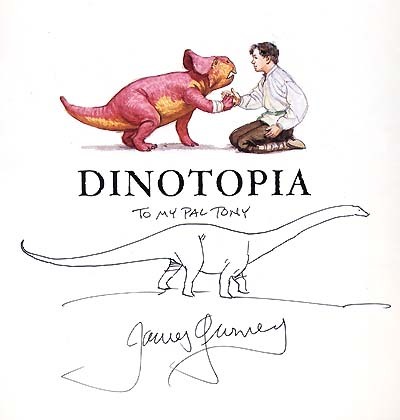 Consider the CURIOUS and AMAZING interaction I have had with Dinotopia deity James Gurney. Actually he goes by Jim…I am not sure if he has any other nicknames like “Jimbo”, “J-Dog” or “The Gurnster…I’ll have to find out. 1992: I am 2 years away from art school graduation, and in the school library, I spy a tome which is wonderful to behold. 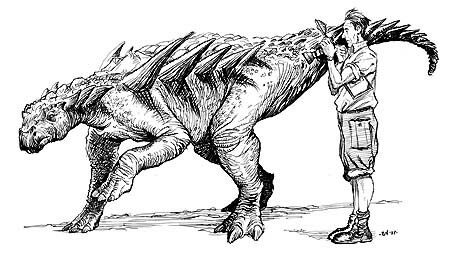 Just like the time I found William Stout’s Dinosaurs in high school, once again the little boy in me is giddy with renderings of prehistoric pretties realistically rendered in a Jules Verne-esque world. On top of that, I have the cursory knowledge to recognize the influence of Sir Alma Tadema (and perhaps a sliver of John Waterhouse?) combined with the observational design so prevalent in books by the late Dutch master, Rien Poortvliet. In short, the combination is somewhat familiar and comfy, while being presented in a completely new fashion. Not since Brian Froud and Alan Lee’s Faeries had I been so blown away by a book. 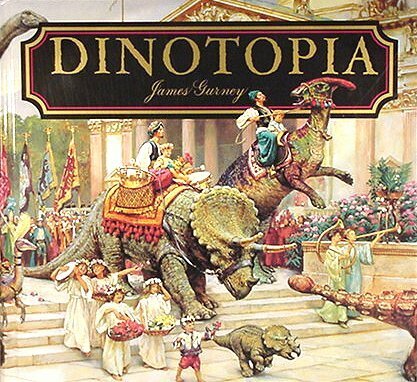 The idea alone was novel enough: turn-of-the-century father and son travelers explore an island inhabited by humans happily co-existing with civilized dinosaurs. But the combination of Jim’s quick oil-wash sketches contrasted against majestically realized vistas – not to mention his wonderful calligraphy, made this book an instant classic with kids and adults alike. And it certainly was in my mind when I designed Arthur Spiderwick’s Field Guide. Many years later, I got to meet Jim at a picnic-party he was holding at his home in upstate New York. Michael Kaluta had invited me to join him on what was a bit of tradition among the Hudson Valley artists (like Stephen Hickman, Jeffrey Jones and Berni Wrightson) where there was food, music, and lots of art show-and-tell. Needless to say, I was seriously intimidated by that talent pool as we drove up from the city. However, all fears were washed away after I met Jim and all of his friends – they were a warm and inviting bunch. Wow. A quote for me from a guy who redefined dinosaurs. I barely knew how to paint when I received this praise. Yesterday, Ang, Sophia and I went to see Jim speak and sign at the Eric Carle museum. 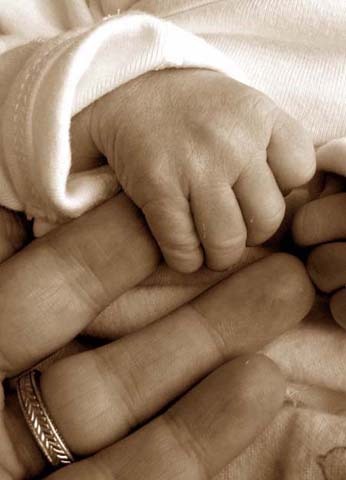 He and his wife, Jeanette, were so happy for all of our successes and our new family. I had to pause at one point and just soak in the moment – it was really cool. PS – Jim’s joined the blogosphere as well. Check it out! My brother, Adam, has pointed out one very important element in this discussion of all things goblin. I would be remiss to not talk about a certain four-legged muse of mine aptly named “Goblin”. Visually, as an artist, I get my inspiration from so many places. I remember one art school instructor telling me that all characters we render will have physical aspects of ourselves within them, because that is the face and body that we see multiple times every day – and I do think it is true. The same could be said of our environment: our homes, yards, children, spouses and even our pets. 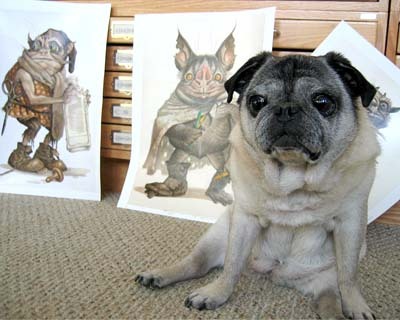 And to say that our dog Goblin inspired and influenced my art would be an understatement. Her pug proportions, mashed-up face, and lovable demeanor, creeped into characters like Ted, Hogsqueal and yes, the Spiderwick goblins (especially the “Bull Goblin”). And there are 2 gargoyles in the Arthur’s Field Guide that are inspired by pets – one is Goblin, the other Chamberlain, Holly’s greyhound. We lost Goblin last fall to cancer. Because it had spread, I had to put her down, and it was the hardest thing I have ever done in my life. Angela and I were devastated. All I wanted was for my daughter to get meet this little dog who inspired me, and been our faithful companion for 13 years. She moved with us from Florida to New York City with stars in our eyes, and on to Massachusetts where we could all settle down and be a family. She is but a memory, but by being this artist’s muse, her influence will live on in the images inspired by her. I guess there really are little goblins out there in the world after all. We miss you Gob, and we’ll never forget you. Using what few visual descriptions I could find, I began thinking and designing. From the start, I made them less human and more animal-like. 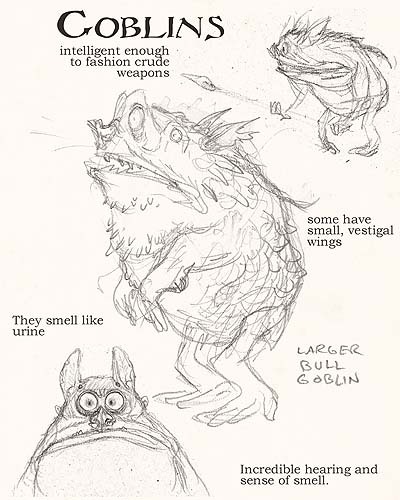 As I’ve said before, there were plenty of great examples of humanoid goblins, and my designs would break no new ground down that path. Besides, I wanted my designs to speak to readers who may not be fans of fantasy. So I attempted to create for a broader audience and I tapped into more primal and instinctive imagery based on general ideas about goblins. Okay, so what animals do we know of are active at night? I could give them large ominous eyes like a bush-baby, or I could give them pale, pupil-less eyes like those found on deep-sea fish. That’s much spookier. In fact, anglerfish in general are creepy looking. Their fleshy skin tags and patterning are ideal for camouflage- something a goblin would need to use to avoid detection. I bet they can change this pattern like a flounder to blend in seamlessly with their background so they can’t be spotted easily even with a seeing stone. Hmmmm. As are toads and frogs (at least by most human standards – think of the cursed Frog Prince), so that was a good starting point. Bat’s faces are usually grotesque and conjure up images of nocturnal activity, plus they’ve plenty of extra-sensory whiskers which may prove handy – especially if these guys are blind. How about extra simple eyes for motion detection like those found on insects and spiders? That would be creepy. 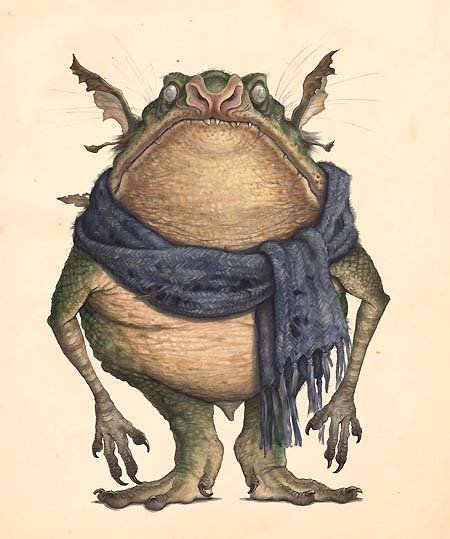 To indicate that they weren’t just ignorant bipedal frogs, I showed that they knew how to fashion tools and weapons and even understood artifacts gathered from humankind’s wake of refuse – hence the discarded scarf which I thought added a somewhat humorous contrast to such a gnarly critter. Lastly, I wanted to add something interesting to the folklore. Nowhere did I read that goblins are born without teeth. In fact, it would probably make more sense if they were born with teeth, perhaps even shedding them like a shark. But, I wanted to create an unusual and memorable natural feature to them…Besides, glass, bone, and metal shards were much more gruesome than just plain old teeth. 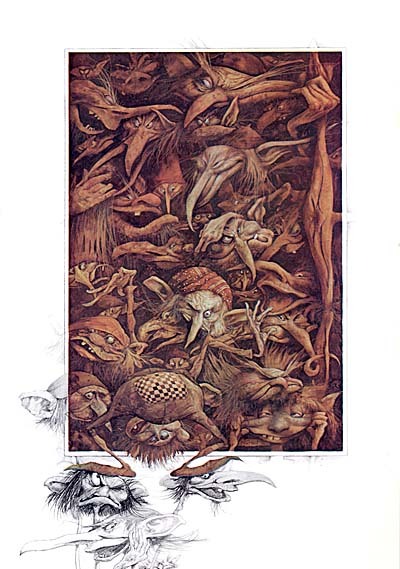 Some day the Spiderwick goblins may be remembered in the annals of faerie lore, perhaps not from my book illustrations, but from the film adaptation – I suppose only time will tell. However, to see my designs brought to life in the hands of master animators who understands how muscle, fat, and bone should move in a convincing manner is a dream-come-true for me. 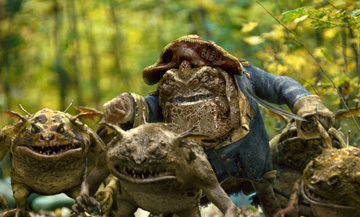 And I think the fact that Phil Tippett used a literal translation of my goblin designs is the highest praise this movie FX Jedi could give me. I know the 12 year-old Tony would be very happy indeed. Living in New York City, and contributing regularly to Magic cards, I was working hard to expand myself on becoming a “more painterly” illustrator and not just be bound by pen & ink. 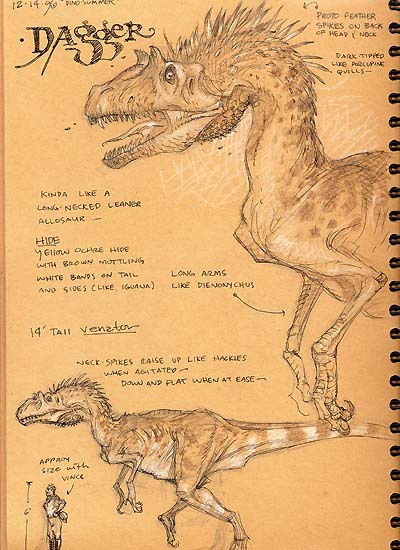 That in mind, I took a lot of life-drawing classes, and frequented the Museum of Natural History where I copied many of the mounted animal specimens. It was here that I began to seriously think about goblins and fairies viewed through the eye of a naturalist as my next big book. 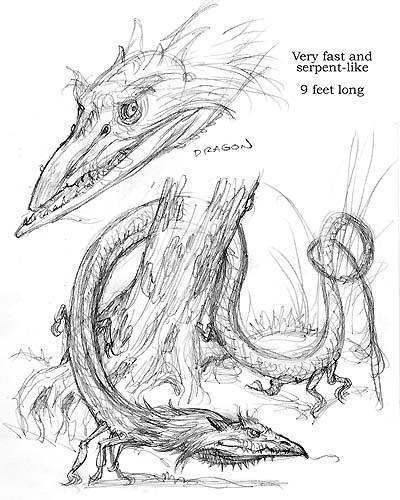 The idea was not new to me: As I’ve mentioned before, I created a field guide to fantastical creatures when I was 13. I returned to that idea in my Planscape heyday and thought of selling the idea to TSR (who published the games). I continued doodling on the idea and began the list of creatures I would like to attempt rendering with John James Audubon-like detail…but I still was not satisfied with my technical ability, and the project was re-shelved until my children’s book career began to take off and I was feeling more confident with my drawing and painting skills. 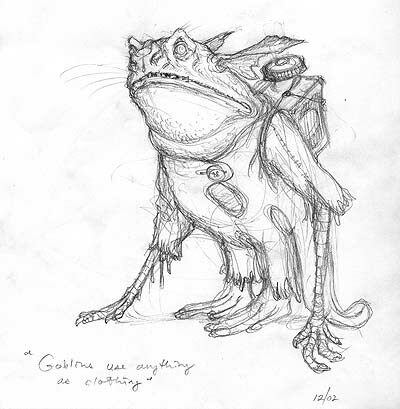 But another aspect had been added to my problem solving which would prove to be integral to arriving at my final gobliny designs. 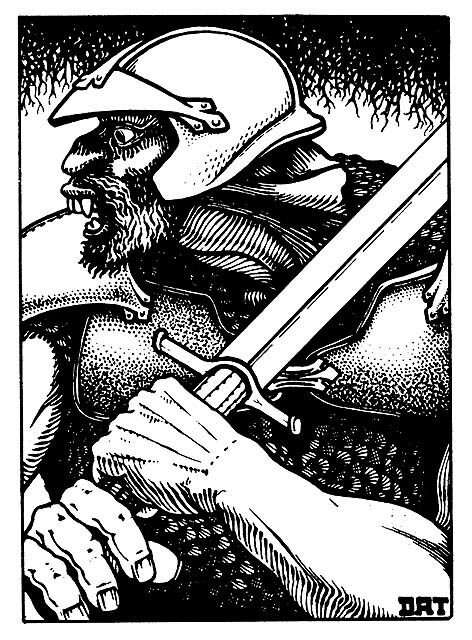 During my years of illustrating for D&D, I had learned how to use the art descriptions that were assigned to me, yet re-invent them in a novel sort of way. I started by isolating the exact points that were stated in the art descriptions. For instance: “this creature is large, blue skinned, and has yellow eyes”, and then exploit what was not said, what was between the lines of text – so its large, but is it obese large? Or muscular large? Okay its blue, but is it a subtle de-saturated blue like a faded flower? Or brilliant like a tropical fish? You get the idea…and I always attempted the unexpected. This thinking worked great – it allowed me to exercise myself creatively while still satisfying the game designers who really had rules and technical aspects in mind more than neat designs. After all, these images were aspects for a game. In prepping for Spiderwick, I took that same thinking and applied it to whatever folklore I could find. 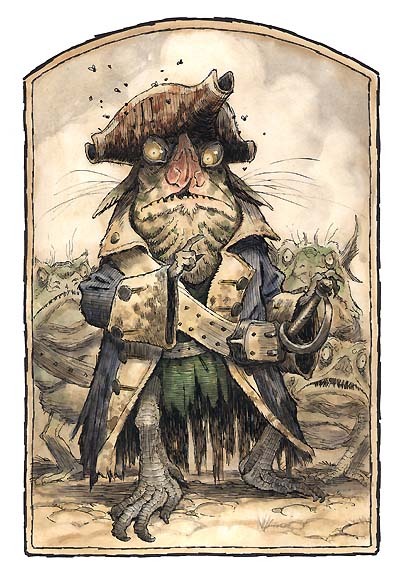 You see, I didn’t want the Spiderwick goblins (or any creatures for that matter) to be contrary to the rich stories and tales that had preceded them, but contribute to the long-running folklore. 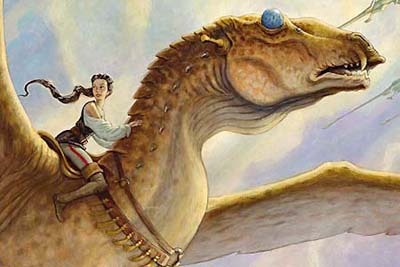 The project slowly came into focus and I set a challenge for myself: Could I take a bunch of well-known, hackneyed, and trite fantasy creatures (many of which I had already illustrated) and redesign them to be fresh and exciting to the savvy CGI-movie-watching-video-game-playing 10 year-old of today? Well, not really. 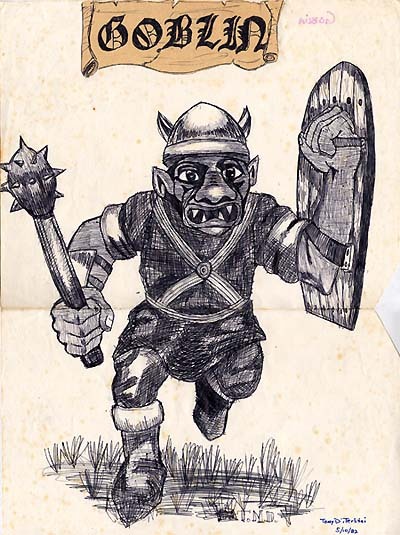 My early work for Dungeons & Dragons and even my work on the card game Magic the Gathering is just a regurgitation of goblins I had seen before. Simple, iconic images intended to be instantly recognized for what they were. 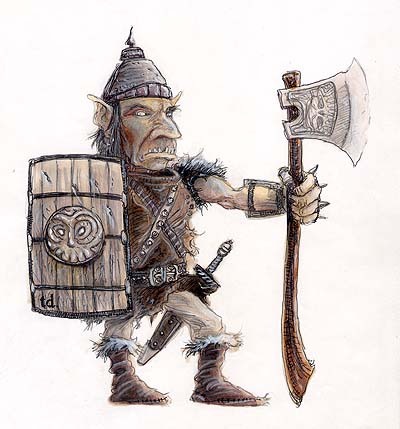 In the case of the illustration for 1994’s Monstrous Manual, I (very crudely) re-interpreted Trampier’s goblin, however mine fails by lacking any action or movement of its inspiration. 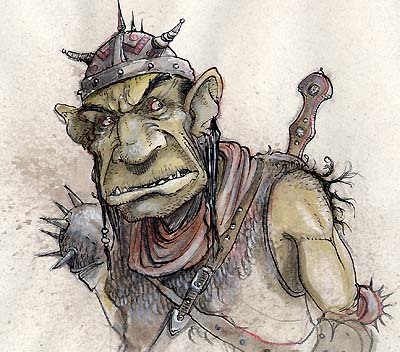 Goblins also made infrequent appearances in the Planescape role-playing game. Though they were pretty close in appearance to their D&D cousins. I think the only difference here is that my technical skill was clearly improving. …or use pre-existing designs from the team of conceptual artists. 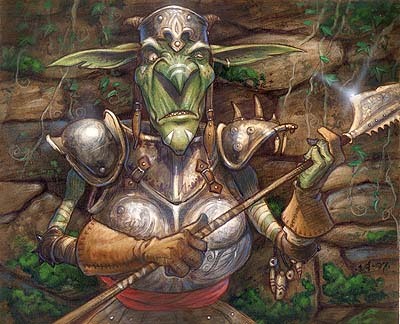 In all cases, I felt the design needed to be simple and immediate due to the function of the art: “This is a goblin and it can cause X to your opponent’s hand”. 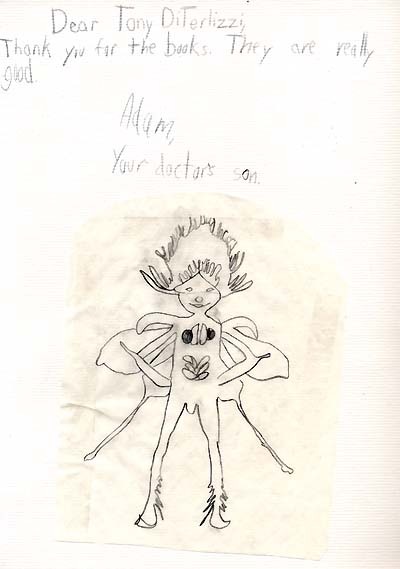 At this time I was also seriously working on my first children’s books and my sketchbooks began to fill with doodles for kid’s book characters right alongside my fantastical Magic sketches. 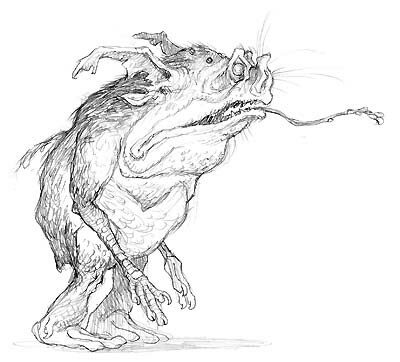 It was the first image completed (and is one of the designs I am most proud of) in Arthur Spiderwick’s Field Guide – and it was brought to life by the magic team of movie FX wizards at Phil Tippett’s studio – the Spiderwick goblins. Or Diabolus vulgaris from the family Adentidae, as Arthur identified them in his Guide to the fantastical world. But how did I arrive at a new design for a creature that has been rendered countless times in books, movies, games and toys? I’d like to share some of the thinking that went into it as it exemplifies the philosophy I used when designing many of the creatures in the world of The Spiderwick Chronicles. My hope is only to inspire others to think out-of-the-box in keeping fantasy alive, fresh, and evolving through exciting design. I know I was introduced to goblins and fairies at a very young age through fairy tales read to me by my mom, like those of the Brothers Grimm and Andrew Lang. 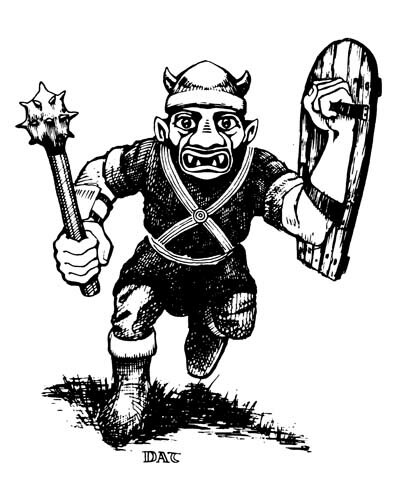 But one of the first images of a goblin that stuck in my mind was David Trampier’s pen & ink illustration for 1980’s Dungeons & Dragons Monster Manual (something I’ve already reminisced about in previous posts). 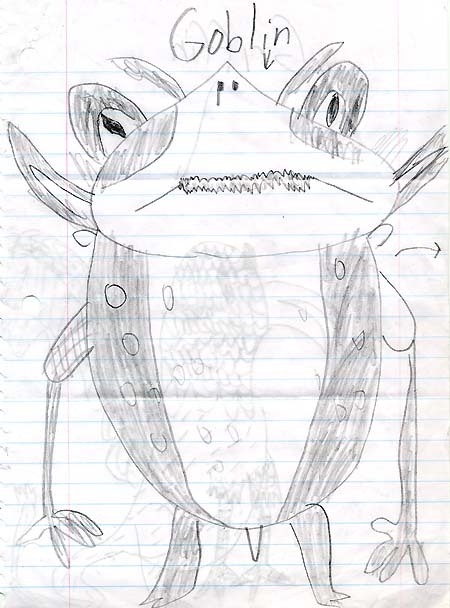 In fact, I still have a drawing I copied from that book when I was 12 years old. The D&D goblins were impish and combat attired. 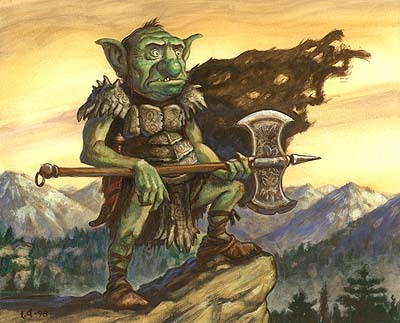 My guess is that they, like many of the D&D humanoids, were inspired by J.R.R. Tolkien’s world of Middle Earth. Yet, C.S. 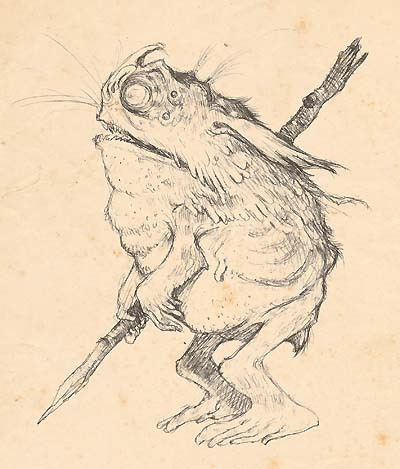 Lewis also mentions goblin-like creatures of the night in his Narnia books…though they may be more demon-like when one looks deeper into Lewis’ thinking behind those stories. 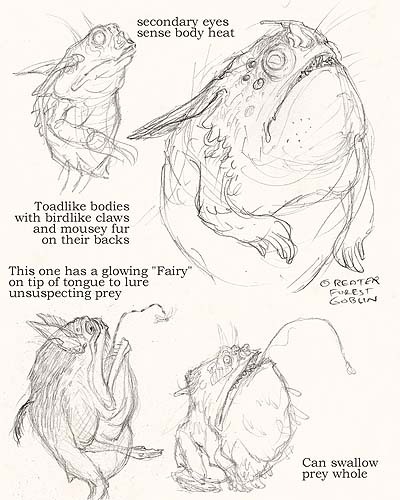 Even movies of that time, like Legend and Labyrinth, have goblins that are similar in nature – the latter, of course, were designed by the faerie mastermind Brian Froud. 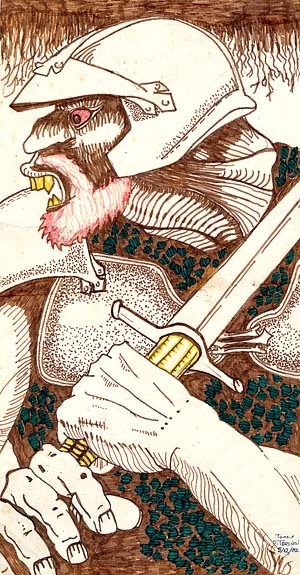 Brian’s goblins are more silly and humorous grotesques, possibly inspired by gargoyles that adorn many of the churches and ancient buildings in England. 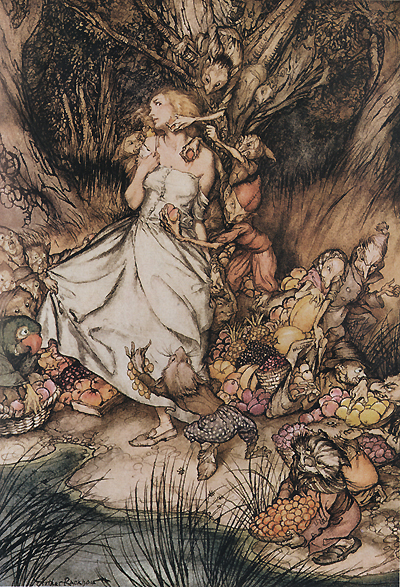 Or, perhaps, the British grand master of fey illustration, Arthur Rackham, inspired him. 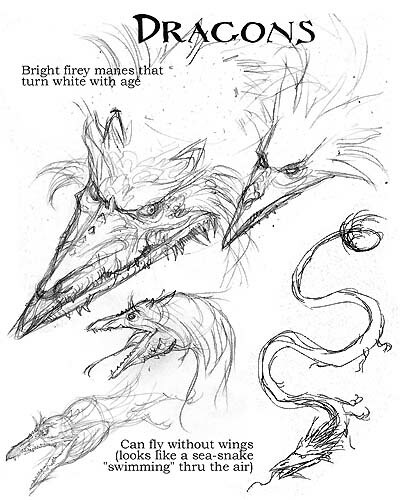 In most cases, even in images earlier than these examples, designs were built upon a small, ugly humanoid (usually green) creature whose motivations run from no-good mischief to malicious intent. Even the Green Goblin in the Spiderman comics pretty much falls into this category – and he was really just a maligned human. 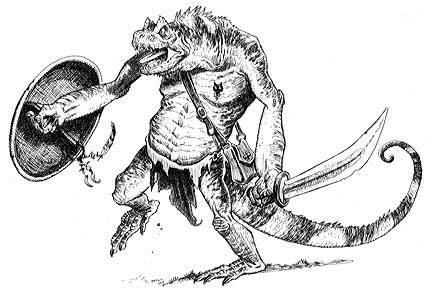 Like I said before, both the original AD&D Monster Manual and the 1994’s Monstrous Manual had a tremendous impact on me both as an artist and a creator of books. 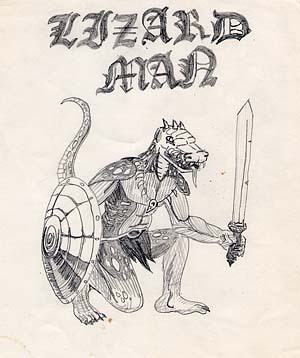 After binging out on D&D, at 13 I spent an entire summer making my own Monster Manual, which was more a field guide full of fantastical creatures from a strange island called “Gondwanaland” (after the ancient super-continent). But instead of giving statistics and game points, I wrote about natural habits, habitats, and even created scientific names for my menagerie. 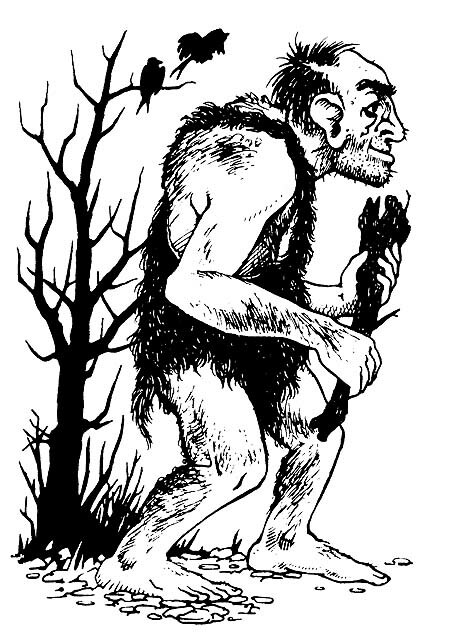 I never forgot about that idea of a fantastical field guide from a naturalist’s point-of-view and that passion went into every image that I did for Spiderwick’s Field Guide – which was full of goblins, trolls, ogres and faeries – very much like the Monster Manuals. I still love the Tolkien-inspired world of Dungeons & Dragons. And, even though I don’t do any illustrative work for the game anymore, I still doodle out some of my favorite monsters just like I did back in 1981. 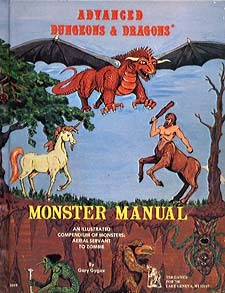 The AD&D Monstrous Manual (MM) was my second monstrous assignment for TSR. 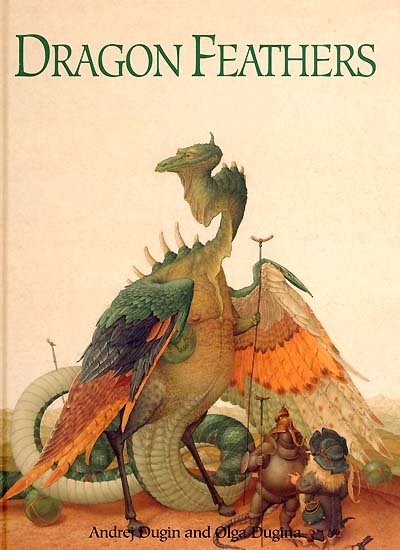 I had just handed in the artwork for my first job, Dragon Mountain, and received a call from the MM editor Tim Beach. It was 1992, I had just graduated from college, and was living with my parents. 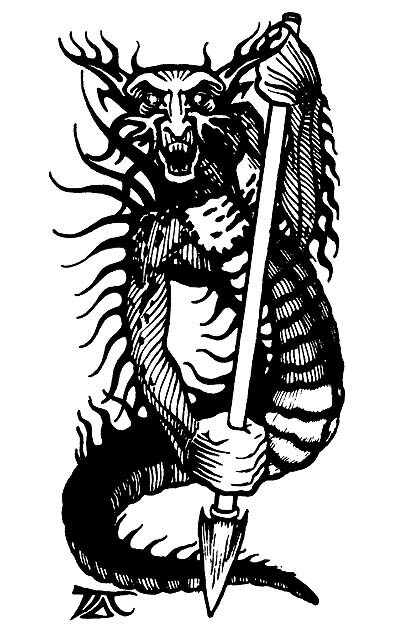 My younger brother, Adam, and my good friend Mike, had encouraged me to submit stuff to TSR and the Monstrous Manual was a dream-come-true project for me. Adam and Mike had encouraged me because they had seen the drawings I had been doing in my sketchbook for the past year of Beholders, Shambling Mounds and Mind Flayers – some of which had been in my initial submission to TSR. So when Tim called me to see my interpretation on their classic creatures I simply just sent him my sketchbook. I had no money (I was still waiting for my payment from Dragon Mountain). So I used leftover school supplies consisting of pencils, Berol Prismacolor markers, and pastel pencils all rendered on laser paper. You read that right. Crappy, crummy, thin-n-flimsy laser bond paper. Of course, it works well for blending the alcohol ink for the markers, but it hardly will stand the test of time. You can see some of my favorite finished images in the ART/GAMING section of the site. 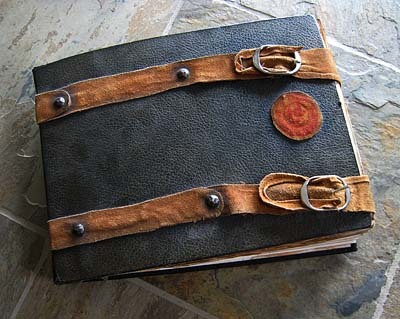 In the meantime, here are some snapshots of the sketchbook that I sent to Tim. 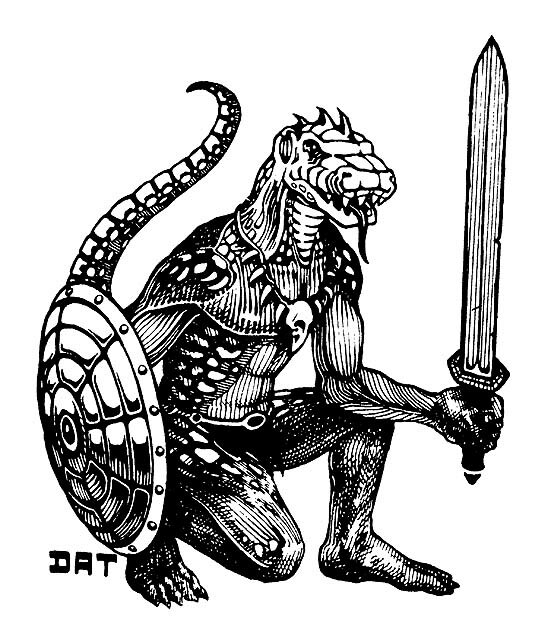 I realized that many readers may no longer have the aforementioned AD&D Monster Manual, don’t remember the art, or simply have never seen it. So, just to give an idea of how groovy it was, here are a few scans of some of my fav images from this book by artist David A. Trampier. …of course, these images are © TSR/WotC/Hasbro. 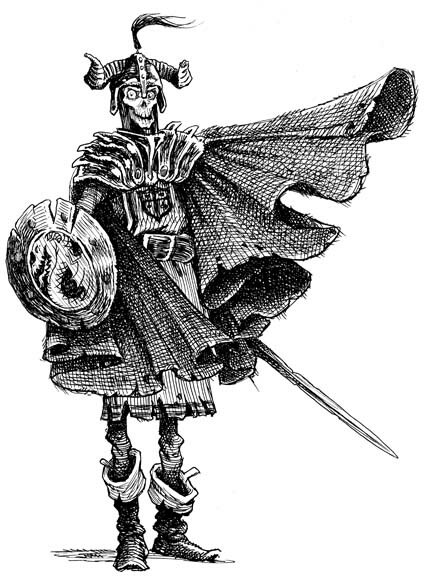 It was a surreal moment for me to be able to get the opportunity to render some of these classic monsters for 1994’s Monstrous Manual, but I’ll yammer about that in the next post. As a maker of books, I am a collector of books. Actually I am a collector of many things as you will soon see in future posts.I want to share books that have affected me in some way: either by art, story or otherwise. My hope is that it will inspire other young creative minds like me or, at least, give a clue to my influences. After the last post, I thought of focusing on Alice’s Adventures in Wonderland. 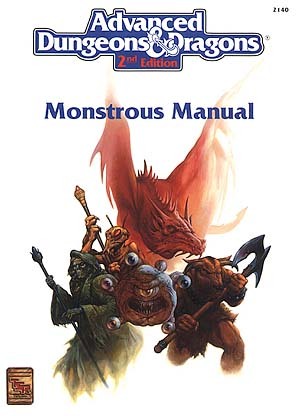 But I think I will save that one for later and, instead, hop to another book that had a tremendous impact on me: the Advanced Dungeons & Dragons Monster Manual. First let me tell you that I did not own this book until about 10 years ago when I bought a used copy at a flea market in Brooklyn – its true. So how could this book have such an impact on me? It is 1981, and a game craze has swept the nation. Next to the Rubik’s Cube and Atari 2600, Dungeons & Dragons (D&D for short) has all types of people rolling dice and casting spells before it recedes to a crowd of brainy intellectuals and geeky nerds. I am in 7th grade, and I fall under that latter category. I attend Murray Middle School (we called it Murray Mental) and I still look like I am 9 years old even though I am 12. At this point in my life I love to draw, and have done so since I was very young – but so too have other kids, so I don’t think I am doing anything out of the ordinary. One of my good pals, Rob, has all things D&D. I have the basic boxed set – and that I have to share that with my younger brother and sister. Rob has all the hardcover books, even the Cthulhu version of Deities & Demigods. I have notebook paper to create my characters on. Rob has pre-printed “official D&D player sheets”. I have one adventure, “The Keep on the Borderlands”, that came with the boxed set, Rob has every adventure module you can think of and the little lead miniatures to boot. But my favorite thing of all that Rob owned was the Monster Manual – an encyclopedia of all the D&D monsters. Immediately I loved the simple, high-school-student-folder-doodle pen & ink drawings of David Sutherland, Erol Otus and, (my fav of the bunch) David Trampier (or DAT, as he signed his art). Sure enough, he was cool about letting me take the sacred tome home where I meticulously copied as many of the images as I could before returning it. He also let me borrow it so that I could use the schools art dept. opaque projector to copy some of my favorites. In a time before copy machines, scanners and jpegs, this was the only way I could get a copy of some of these cool images for my own library. And I loved these drawings so much. I still have them to this day. Sometimes I wonder why it is I am so driven to do what I do. I decided I wanted to write and draw stories for children my senior year in high school. My art teacher, Tom Wetzl, gave me a one-on-one assignment of my choosing for my portfolio. I chose to re-imagine and re-illustrate Lewis Carroll’s classic, Alice’s Adventures in Wonderland. Re-reading the book had me hooked in ways it had never done before. I saw a deeper working to the words and pictures and tried to find allegories in it that I could relate to. Almost the way we try to associate to the meanings of lyrics in our favorite songs. I ended up re-reading all of my childhood favorites, House at Pooh Corner, The Lorax, Where the Wild Things Are, etc, and KNEW this is what I wanted to be when I grew up. Anyways, I finished art school, worked for Dungeons & Dragons and bunch of other fantasy projects that were rich and rewarding to me. And all the while, I tried to sell my children’s book ideas to publishers. Finally I was successful at doing it, and a logjam of ideas and concepts for stories (some that had been in my head since I was very young – especially one about a certain fantastical field guide) began to flow out of me. Every day, I feel like there is never enough time to tell all the stories and create all the books I want to in my life. But I never really asked myself why I HAD to do this. There were so many directions I could have taken my art – right after receiving my degree, I tried submitting caricature and editorial work to all major magazines. I did fine arty modernism paintings in college and hung around a lot of local art galleries curious as to how one made a living as a painter. I even came pretty close to becoming a puppet builder for Jim Henson’s company. But somehow, I really only wanted to do books for kids. Why? I suppose because I felt that if I had something to say, I wanted to say it to the younger generation and the families that surrounded them. I kept my childlike wellspring free of the clogs of cynicism and the muck of reality – no matter what Angela and I were experiencing in the world around us. 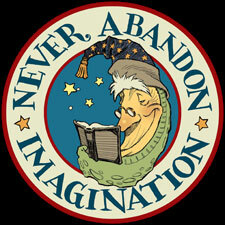 I felt that was my job, my duty, to tell children to keep imagining, keep dreaming, and keep going on adventures of fun. My idea wellspring is still very full and very unclogged. But last month, my daughter Sophia was born, and something got in my waters of inspiration that had not been there before – something that made me even more excited about doing what is that I do. I can’t quite put my finger on it at the moment, I am still basking in the amazement and joy of this event, but I think that all the time and energy I have put into entertaining and inspiring other kids (and kids at heart) has come back in the form of a baby of my own so that I can relive and recharge my childhood as Ang and I experience the world again through her eyes. What a grand adventure this will be.